Today, Apple CEO Steve Jobs demos iMushroom, a new product designed in Cupertino to revolutionize gadget upgrading. Until now, iMushroom was only a concept in video games such as Nintendo Super Mario Bros. The concept product sitting around as a perceptual prototype was never meant to be a product accessible to real consumers. 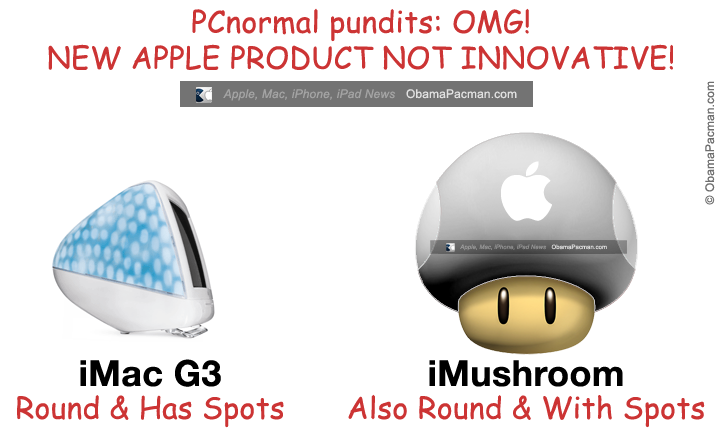 But today, iMushroom, the Apple magic mushroom joins Magic Mouse and magical iPad to become a real product. The Apple iMushroom is a conversion tool for existing iPhone and iPod touch to make them grow into the large iPad tablet. 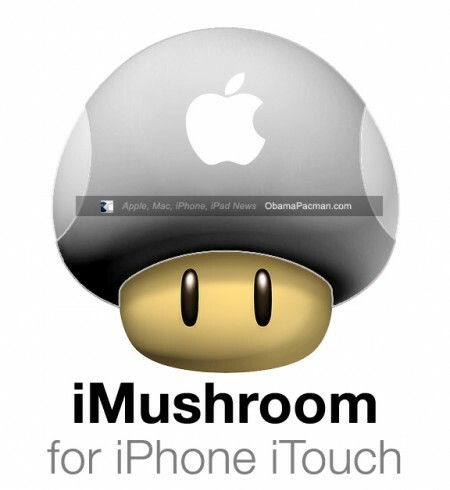 iMushroom is very easy to use. Just bump your iPhone or iPod touch with the iMushroom, and boom, your Apple touchscreen device becomes the new iPad tablet. It just works! Armchair critics are out in force on internet forums, ignoring the various new patented innovations introduced with the Apple iMushroom. Meanwhile, Apple’s new iMushroom is expected to revolutionize gadget upgrading. 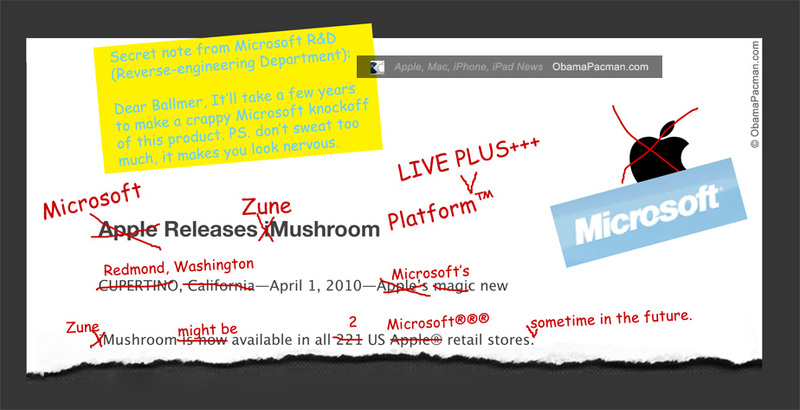 “From Redmond, Washington, Microsoft’s new Zune Mushroom Live Plus+++ Platform™ will be available in all 2 US Microsoft retail stores sometime in the future. Microsoft has been working on this innovative technology for years, using our patented Microsoft Vaporware Plus Live technology, we will use (oops we meant work-with) our partners to drum up some vaporware to prevent some people from buying this new Apple product. 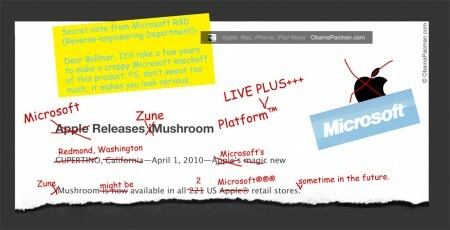 Barely after Microsoft CEO delivered that statement, Microsoft apologists claim the HP’s Late Mushroom model (somehow sounding like HP Slate), which has no specs, no feature list, no price, and no delivery date, will be the Apple iMushroom killer. 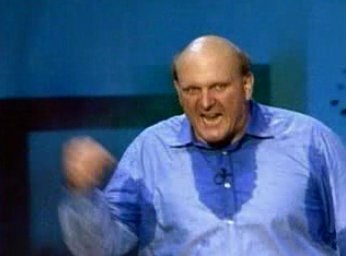 Unfortunately, the rest of the statement was drenched in Steve Ballmer sweat and beyond salvage. Meanwhile, consumers are excited at the new innovative product from Apple. 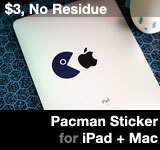 Some hope it will help usher in the next decade of Apple wins. PS. The advertising agency responsible for the iMushroom poster mention that they ran out of room so they are re-branding iPod touch into iTouch. The the original iPhone + Mushroom = iPad image source is attributed by gizmodo to 9gag.com/gag/17909, but that doesn’t seem to be the person who made it. So, let us know if you know who made the original image. Microsoft CEO photo is real, not a photoshop. The rest of the photoshops are by OP Editor. This entry was posted on Thursday, April 1st, 2010 at 8:18 pm	and is filed under iPad. You can follow any responses to this entry through the RSS 2.0 feed.